The Giant King is here! Also, What’s Next? Get The Giant King Now! 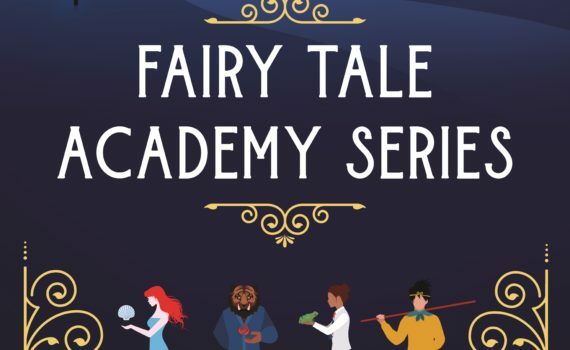 I literally couldn’t pick a favorite character from my Fairy Tale Academy series. Each character has come alive in my head. Jak and Maggie are no different. My take on the traditional Jack and the Beanstalk is, in my opinion, hilarious. And sad. You see, in a sick twist of fate Jak accidentally killed the giant king, which makes him the new king, a position that can only be relinquished by a duel to the death. Maggie (or Magnolia-which is another name for Mulan) is the only person at the Academy who can best a giant in a fight. Toss in a grouchy giant bodyguard and all sorts of interesting things happen. Here is The Giant King! I felt like a little limerick today! ‘Cause school made her stub her big toe. 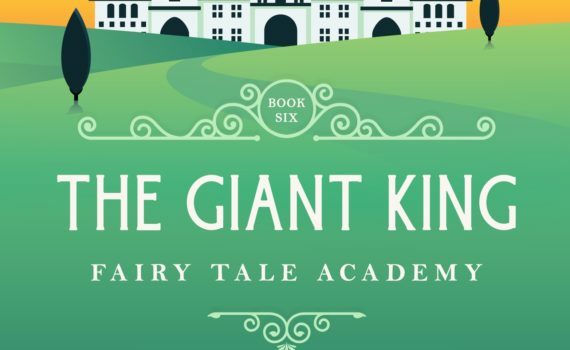 This is, obviously, a Jack and the Beanstalk retelling. 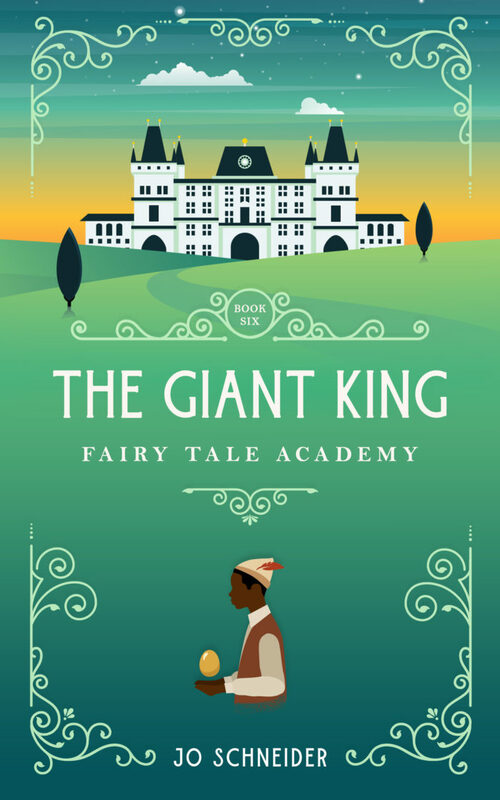 In my version, it was the king of the giants that fell down the beanstalk, and because Jak killed him, Jak is now the giant king. Good thing Maggie (*cough* Mulan) is there to help him. Official release day is Wednesday, April 3rd! I’ve had so much support and excitement for these books, that I’m going to have another fan appreciation day, which means the price will be 99 cents on release day! Here’s the first chapter. Enjoy! Jak sat on his bed and stared down at the objects in his palm. The opaque, green, kidney-shaped beans made a neat little pile. He used his thumb to spread them out, as if looking at them from a different angle would help him understand. Jak’s eyes moved from the beans to the folded parchment sitting next to him. He sighed, dropping the beans back into the red velvet bag and pulling the drawstrings shut. Then he gently set it on the bed and picked up the parchment. His mother hadn’t bothered to seal it. Instead, she’d simply folded it in quarters, then rolled it enough to get it in the bag with the beans. The parchment crackled under his fingers as he unfolded it and found his mother’s neat script on the page. He’d read it more times than he remembered, but some part of him hoped that if he read it again, he might find a different meaning in it. I’ll keep this brief. The council has agreed to let you stay at the Academy for two years, which keeps you out of their way, and safe. When they bring you home, it is likely that one of them will challenge you for the throne. While I understand how terrifying that must be for you, you need to focus on the more pressing matter of our fields. A majority of the crops from the summer have failed, and as you know, the soil has become toxic. There is enough in our stores to last through the winter, but if we can’t grow anything in the spring, we will have to find another way to feed the people of Oreroth. The giants will blame us, and their solution will be to let us starve while they take what they need from another kingdom, which will result in a war that will likely cascade out of control. The giants do not know the extent of the problem. They think it is a few fields and just the bean crop. We need to keep it that way. Find out where the beans I sent with you came from, and how they work. Get back to me as soon as you can. “Sure, Mom. No pressure.” Jak refolded the parchment. The slender bed creaked as he rose to his feet. The desk drawer gave a squeal as he opened it and put the letter inside. The room looked almost as barren as it had upon his arrival. The desk sat at the far end of the bed, the long side against the wall. Beyond that, light poured in through a window. A single blanket lay on the bed, now wrinkled from him sitting on it. The dresser stood at the head of the bed. An invisible line ran down the middle of the room, and the other side was a mirror image of his own. Only no one slept there. The pounding penetrated the wood, and likely the entire building. Jak wondered what the Academy made their doors of. There wasn’t much that could stop a determined giant. “Your Highness, we need to get going.” Beklor’s voice dripped with irony. “I’m coming. Don’t have a cow,” Jak said before Beklor started pounding in earnest. Jak caught his reflection in the full-length mirror on the back of the door. Tall and lean, Jak looked like a beanpole in his school uniform, which consisted of a white shirt, black pants, a red-and-blue plaid tie, and a red jacket. The collar of the shirt struck a drastic contrast with his ebony skin. His mother had cut his black hair short the month before, and it had finally grown enough to form tight curls on his head. He adjusted the tie, smoothed the jacket, and reached down for his blue messenger bag. A low growl floated through the door, and Jak reached out and turned the knob before Beklor began foaming at the mouth. Beklor’s wide frame practically filled the doorway, and he had to lean down to see beneath the jamb. His massive shoulders barely fit into the black tunic he wore, and he’d ripped the sleeves so his muscled arms could be free below the elbow. The gold belt buckle around his thick waist had to weigh more than Jak’s head. His boots, which rose to Jak’s mid-thigh, cinched around his muscular calves. Beklor ignored the remark. “We’re going to be late.” His dark blue eyes regarded Jak. He’d pulled his long blond hair into a ponytail at the base of his neck. Beklor stepped aside and followed Jak down the stairs. They’d arrived late the night before, and hadn’t had a chance to look around. A smattering of furniture filled the lobby. A semi-circle of chairs had been dragged to the fire, and Jak could imagine students gathered there, laughing and talking. Now they sat deserted except for a single figure standing before the fireplace. He must have heard Jak and Beklor, because he turned to greet them. He wore a school uniform. Short brown hair topped his head, and the color of his skin sat somewhere between the pale white of the northerners and Jak’s. He had to be about Jak’s age, but he carried himself with almost as much confidence as Beklor. “King Jak?” the young man asked. Beklor let out a little grunt. “Not as big as being king,” Tayle said. “But we’re not talking about that.” Jak put a finger to his lips. Tayle’s eyes flickered to Beklor. “I am the giant king’s keeper,” Beklor said. “Good to meet you.” Tayle didn’t hesitate to shake Beklor’s hand. Tayle opened the door and held it as the other two went through. “Mind your head,” Jak said to Beklor. “How? By outwitting him?” Jak might be taller, but Tayle obviously worked out and could probably tie Jak in a knot if he wanted to. A cold breeze licked at Jak’s skin, and he shivered. Gray clouds hung low in the sky. “So the rooms get better as you go?” Jak asked, noticing that the fourth-years’ building was much larger than the first-years’. A huge, round building stood across the cobblestone path that ran in front of all four dorms. “That’s the library,” Tayle said. “The entrance is on the far side.” When they reached the edge of the fourth-year dorms, Tayle turned right. They followed the curved wall of the library around to the first of six other buildings. All were roughly rectangular and rose one to three stories. Tile covered slanted roofs to high peaks. Jak lost interest when he got around the library far enough to see the square. Before him stood a fountain with a two-tier bowl resting on the backs of a human, an elf, and two others that he couldn’t see. At the edges, eight statues representing other races spit water into the pool. Cobblestones lined the fountain’s perimeter, which sat in front of the library and formed a box around a large expanse of grass. Several clusters of tables with benches dotted the area. “Do you guys paint the grass green?” Jak asked. “And defend,” Beklor said in a serious voice. Beklor gave him a jab with his elbow, and Jak swatted him away. “It makes things awkward,” Jak said. “They should know who you are,” Beklor said. Tayle watched the exchange, then waved for Jak to follow. A few heads turned their way as they approached. Most eyes went wide when they spotted Beklor. Jak could only imagine the expression the giant was giving them. “Be nice,” Jak muttered. Tayle stopped a few feet away and waved a centaur over. Short, white hair the same color as his coat and tail stood up in spikes. A swirling blue tattoo started on his cheek and disappeared into the shirt of his uniform. The centaur turned to Jak but did not approach. Instead, his eyes slid from Jak to the giant behind him. A strangled sound came from Beklor, but Jak ignored him. He would have to endure the Pride-of-the-Giants speech later, but for now he could pretend like he was a normal teenager. Haleros made a hole, and Jak slid in next to a short girl with almond-shaped eyes. Her straight, dark hair hung to her shoulders. She barely gave him a glance before returning her attention to the game. Winters were long in Oreroth, and Jak and his father had spent countless cold nights playing and discussing the game. It only took Jak a moment to assess each board and take an educated guess at their strategy. One pair of players had just started, another looked to be in the middle of a game, and the last were only a few moves away from the end. Another inspection showed Jak that the game that looked half over would be decided in the next three moves. If the satyr didn’t notice the goblin’s strategy, then he would likely lose. “What are your thoughts on that one?” Haleros asked. “Then why is everyone so quiet?” Jak asked. “You’re wrong,” the girl next to Jak said. “Glad to know you can still be taught,” the girl said before walking away. Jak tried not to stare. A girl who knew that much about Shiji was worth getting to know. “You might be right,” Haleros said. Would you rather: face a hoard of enemy soldiers or eat a live octopus? Prince Damon stared at the writhing, eight-legged creature in horror. The bulbous head lay flat on the wooden deck, and the black eyes stared up at Damon. A gust of wind hit and the sails flapped and the mast groaned as the deck pitched. The little creature started to slither away, but a bare foot kicked it back into the middle of the circle of onlookers. “Go on,” one of the sailors said. Damon swallowed hard, trying to keep from throwing up at the mere thought of those tentacles sliding over his tongue and down his throat. The suction cups holding on to the roof of his mouth in an attempt to live. Damon shouldn’t have to earn the crew’s respect. He was their prince, they all swore allegiance to the crown before the ship left port. One word from him and any man here would be tossed overboard. Yet he’d heard the sailors whispering when they didn’t think he was around. Whispers of his humiliation in the battle for the Folded Pass. Rumors that he’d run away to save his own skin. Rumors that his father had spent a great deal of time squashing. Jack sighed. “I’ll show ye.” The grizzled sailor stepped forward and held out his hand. One of the deck boys placed a slender stick about the length of Jack’s forearm in his palm. The first mate reached down and grabbed the octopus by the head and plucked it off the deck. The tentacles tried to coil around Jack’s hand and wrist, but Jack wrapped the head around the stick and then continued to wrap the rest of the body and legs until the creature was bound. Jack gave Damon a wink right before he shoved the slimy head of the creature into his mouth. Jack sucked the rest of the octopus in as if it were noodles. He gave Damon a wink and then swallowed. A cheer rose from the sailors, and one of them hit the golden gong that hung next to the wheel. “You have another?” Damon asked in a weak voice. “Aye.” The first mate waved a hand and another creature, slightly larger than the first, landed on the wooden deck with a splat. It immediately began to crawl away, but the sailors pushed it back at every turn. Damon’s father said if he didn’t cast off his cowardly ways that he shouldn’t come back. If this crew didn’t trust him, then he’d likely end up at the bottom of the ocean, and while the thought of eating the octopus send waves of prickly disgust and fear through him, the urge to stay alive overpowered it. Damon grabbed the stick and reached down to grab the octopus. The squishy head retreated from his touch, and the tentacles flailed as he stood. Before he could think too much about it, Damon followed Jack’s example and wrapped the doomed creature around the stick. He took a breath, trying to mask the scent of the creature with the rancid smell of the sailors around him, and opened his lips. He’d been hoping more for noodles, but the head was large enough that he had to open his mouth like a snake eating a rat. His tongue shied away from the trembling flesh, and one of the tentacles clung to his thumb. “No chewing. Just swallow,” Jack muttered. Something between a sob and a laugh escaped, and Damon shoved the living thing into his mouth. His lips closed around the end of it, and for a moment he imagined eating a piece of fatty meat. Then the meat inside his mouth moved and his stomach heaved again. Damon nodded. He could feel the octopus moving in his mouth, trying to find an escape. Damon tried to swallow, but nothing happened. He gagged, heard the sailors chanting “Eat it!” and finally forced himself to finish it. A roar of approval went up from the men on deck. Damon did so, still wanting to throw up and imagining the creature trying to hold on as it slid down into his gullet. Tears ran down Damon’s face, but no one seemed to notice as the sailors rushed him, patting him on the back and congratulating him. Damon tried to answer, but could only nod. He should have stood his ground in Folded Pass. It would have been easier than this. So I had to Google eating live octopus for this. I’m a pretty adventurous eater, but I am not doing that. No way!